I am a big fan of Stephanie Butland’s emotive writing. Her last novel, Lost for Words, was one of my top reads last year. (You can read my review of that here.) Loveday and Archie from that book are characters who have stayed with me long after I finished reading. 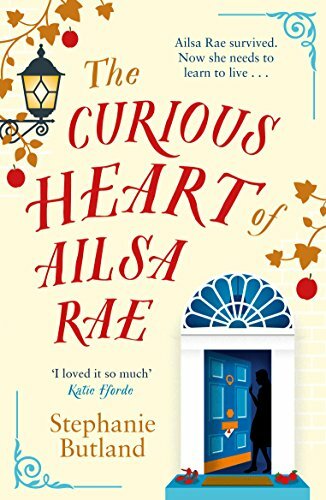 So The Curious Heart of Ailsa Rae had a lot to live up to! Ailsa is not as spiky a character as Loveday and certainly faced very different challenges but she is just as memorable in her own way. Ailsa has had a heart transplant and this book follows her as she recovers from her operation and begins to live without the shadow of death hanging over her. Thankfully, I can only imagine what it must be like to live with a life limiting condition but Stephanie Butland makes it clear that there is a huge strain on Ailsa’s friends and family too, particularly on her mum Hayley. The book made me really think about what it must be like for transplant patients afterwards. Along with the relief and gratitude of having that second chance, there must always be the fear of rejection, the worry about what will happen if it doesn’t work out. There must also be a huge psychological impact, getting your head round the fact that someone else has died thus giving you an opportunity to live. All this comes across in the character of Ailsa. She has to come to terms with the fact that she does have a future and that she has to make own decisions, take risks, stand on her own two feet and live again. Part of the story is told through her blog and she quite often asks her blog followers to make decisions for her, sometimes with unexpected results. In a book which makes you think about organ donation and the difference it makes in someones life, we are shown through the character of Lennox that it’s not always a happy ending. This is something else which Ailsa has to come to terms with, the fact that she has lost someone she loves because he got too ill for transplant and that it’s just a combination of circumstances which means she got lucky. The other main character is Seb, who is a rather well known actor. Theirs is a chance meeting on a radio show about transplant recipients. He has had a corneal transplant and has taken some time off from acting while his eye heals. Ailsa and Seb really hit it off as friends and a lot of their communication is by email. They both have quite a dark sense of humour which comes across in their emails. Having undergone transplants, albeit for different reasons, they both have an understanding and appreciation of what the other has gone through. The passionate dance, the tango, plays quite an important part in both their lives but I don’t want to say in what way for fear of spoilers. I loved seeing how Ailsa grew in confidence throughout the book as she began to realise she could trust her new heart and allow herself to make decisions, whether they were right or wrong. I felt content to leave Ailsa at the end of the book, perhaps not knowing for sure how life would turn out for her but knowing that she had the confidence to stand on her own two feet and strike out on her own. I must mention the Edinburgh setting of the book. I feel that Stephanie Butland really captured perfectly the atmosphere of my ‘multi-storey city’, as Seb calls it. I was honoured to be asked by her to read a very early copy of the book, to cast my eye over the Edinburgh details and it’s a thrill to see my name mentioned in the thanks at the end. I was pleased to see Portobello mentioned, which is where Lennox lived. I had a bit fun working out where his house would be, not far from my own I reckon, and what pub Ailsa and her mum visited. In The Curious Heart of Ailsa Rae, Stephanie Butland has once again proved she can write a compelling story tackling big issues while making the reader feel a real part of her characters’ lives. It’s a warm-hearted story (and yes, I do use that phrase intentionally), funny at times and always feels very grounded in reality. It is a hopeful yet frank look at learning to live with new expectations.